‘Coherence’ is a clever science fiction film that utilises primarily one setting and the idea of a dinner party to tell a story that becomes increasingly complicated. It clocks in at under 90 minutes and it’s just as well – the longer the film delved into its themes the harder it was for the viewer to follow and I think it would have lost me if it had went any further! The film was shot without a script, with each actor being given only an outline at the start of each shooting day, and this creates a natural feel in the performances and helps to drag the viewer along with the character’s actions and thought processes as the complexity of the situation increases. The film has a fairly straightforward premise to begin with. A group of four couples are meeting up at one of the couples houses for a dinner party, on an evening when a comet is due to pass the earth, when a combination of strange occurrences and personal revelations threaten the group dynamic. It begins with everyone losing phone signal (and a couple of the phone screens cracking) and escalates increasingly after the house loses power. The principles of the film are rooted in science fiction, but the feel and atmosphere verges more towards horror with a feeling of increasing dread taking over the characters at each passing revelation. The skill that keeps this compelling is in the way director James Ward Byrkit and his actors deliver key pieces of information that increase the conflict between the characters. I found the plot to be complicated, but not overly so, but it is important to pay attention to keep track of each development. There are plenty of twists and turns but they all feel like the natural next steps based on the previous actions, and it helps that the characters are as confused as the viewer every step off the way. The cast are mostly strong (the woman that plays Laurie (Lauren Maher) isn’t great though), and they help to drive a story which shows the ability to create a strong piece of science fiction without a massive budget. 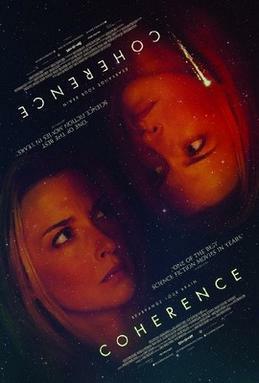 ‘Coherence’ is a strong slice of science fiction that merges horror elements and a series of clever twists to create a thoroughly enjoyable film.